GEORGETOWN - Secretary-general of the Caribbean Community (CARICOM), Irwin LaRocque, has urged Sweden to use its position in two major international organisations to highlight the unfair labelling of some of the Community’s member states as “non-cooperative tax jurisdictions”. “As a member of the EU and the OECD, Sweden can assist in encouraging these bodies to be guided by the informed position of the relevant global regulatory authorities and desist from their unnecessary seemingly punitive actions,” he added. 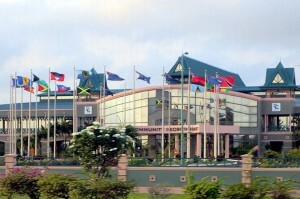 The secretary-general called attention to the decision earlier this year by the European Union Council to screen some CARICOM member states to determine whether they were co-operative tax jurisdictions using new criteria. “The stated criteria go beyond the generally accepted international tax transparency and accountability standards which our countries have been meeting over the past several years,” he pointed out. It was extremely onerous for small countries to address different international initiatives that dealt with the same, similar or related subject matter yet stipulated different sets of criteria, he observed. “There appears almost to be a predisposition to blacklisting our countries,” LaRocque stated. He said a major consequence of this blacklisting was the “de-risking” strategies being employed by certain international banks which had resulted in the withdrawal of crucial correspondent banking relationships. “This particularly affects our indigenous banks and other financial services entities and could lead to the disconnection of our small economies from the global economy and international trade. Its socio-economic impact would be disastrous, given that remittances which are the main source of income for many of our poorest citizens will be affected,” the secretary-general said.